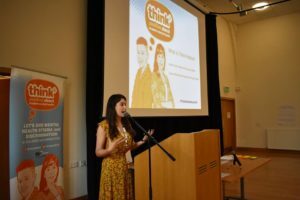 Think Positive is NUS Scotland’s student mental health project. The project aims to find ways to support students experiencing mental ill health, tackle stigma and discrimination, and promote wellbeing in colleges and universities. Think Positive is an umbrella term encompassing two main projects, Healthy Body Healthy Mind Awards and Student Mental Health Agreements. In 2018, both projects were awards funding to help them develop in various ways. Here’s an exciting update about some of the things we’ll be working on in the next few years. Think Positive will commission external research to look at the current mental health provision across Scotland’s colleges and universities. There is very little data on this currently and we hope this will help to highlight best practise and gaps in provision. In 2019-20 there will be a small grant scheme enabling institutions to trial a new idea that is related to their SMHA. Another person has joined the team, who will lead on the website, social media, events & small grants scheme.